Prince George handled his first public engagement skillfully: he allowed for some excellent photo ops, wore a nifty outfit, and only made one child cry. 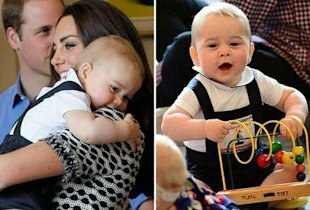 Yes, as anticipated, George shared crawl space with 10 other babies on Wednesday at Government House in New Zealand, as his parents looked on. George-sporting blue Rachel Riley dungaree shorts with a sailboat on the front that no doubt will sell out before the end of the day-played with building blocks and a xylophone, and generally looked quite at peace. Meanwhile, Kate-in a Tory Burch black-and-white dress-"watched on protectively, occasionally wiping his chin," according to People. Oh, and Prince William was there, too, reportedly remarking, "It's madness, there are babies everywhere!" which gives us a sense of what William's Twitter account might be like ("Driving home, there is so much traffic!!"). The eight-month-old was observed to be "one of the biggest babies there," according to reports, as one participant noted he's "quite a bruiser." A pretty solid first public engagement, we'd say: a sharp look, praise for your size, Kate Middleton wiping your chin. The only hiccup, as it were, seems to have been when George was "stopped in his tracks by baby Amelia Howe who grabbed a plastic block from him." Amelia then started crying, as her mother "apologized to Kate for the bawling." (Amelia will no doubt be selling her story to a British tabloid by the end of the week.) Meanwhile, George seems to already have a good handle on conflict resolution, as the Daily Mail reports, "[George] then got hold of a blue plastic block which he put his mouth."